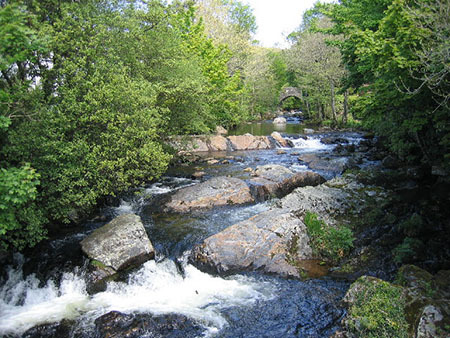 The southern Gateway to Dartmoor, Ivybridge is a central jumping off point for moorland holidays whether these are actively walking, cycling, horse riding or an unwinding, relaxing break and anything in between. Erme Plym Trail – 10 miles to Hooe Lake, Plymouth. 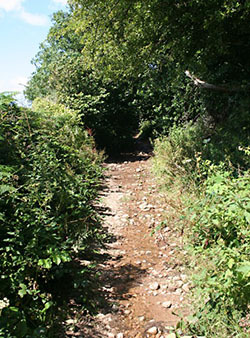 Two Moors Way – 100 miles over Dartmoor, Exmoor, and the valley between, to Lynmouth in North Devon. The town itself is now becoming modern with new shopping areas, a leisure centre and new housing estates. Not a bad place to live, close to the moor, countryside, a main road, the city of Plymouth and beaches close enough to visit for a few hours. Ivybridge welcome tourists to their town and both bed and breakfast and self catering accommodation is available. (Check out the right hand column!) Plenty of shops for self catering needs. 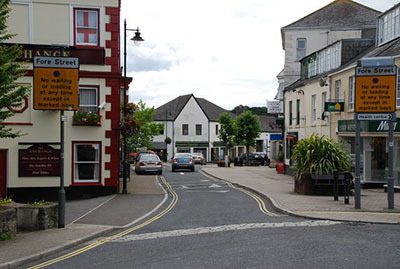 The town’s residents occupy a small fast growing town with Dartmoor’s Western Beacon looming above on one side and on the other fertile green fields of a pastoral landscape. Its name is its history. Ivybridge. The name stems from a land dowry in 1280 that states that the land was to the “west of the River Erme by an ivy bridge.” A bridge covered in ivy. An ancient bridge, with an ancient road, over an animated stream. Says it all really. It is an old town that has seen history traverse its bridge, and the folk of the town have had the surging energy of the stream. Hardworking people, changing with the times, from agricultural and tin mining, to industrial, to tourism. Now the town bursts with the energy of one of the fastest growing towns in Europe. The small ancient bridge that gave its name to the little village that was to become town is now on the northern side. The road over the bridge was narrow but it was the old highway from Plymouth to Exeter. A historic road carrying traffic from the important port to the county town and then on to the capital. In its early days it was no wider than enough for a rider or a pack animal. As the town grew it had to be widened. Eventually the town grew too large for it and in 1819 another bridge was built and a turnpike road created. The new road led straight into Fore Street, the main street of the town. Close your eyes and listen. Can you hear the coach and horses of one of the first postal services clatter over the old bridge? Can you hear the stagecoaches as they pull up to the London Inn? Can you hear the horses hurrying to London to tell of the struggles of the Civil War, the Monmouth Rebellion or tell of Armada? Did Raleigh cross that bridge, or Drake, or Grenville? Can you hear the marching footsteps of Saxon warriors over maybe an even earlier bridge? Perhaps you can hear the myriad footsteps of centuries, of ordinary folk going about their business. If only the bridge could talk – what stories it could tell! Painters have seen its magic, Turner among them. His watercolour of the bridge c1813 is part of his “Rivers of Devon” 1813-1823 paintings, given to the Tate collection. The River Erme scurrying under the bridge, carries the spirit of the area. Its fast flowing stream has given birth to the fertile landscape around the town that fed its people, been the power that drove the wheels of corn, paper and cloth mills and gave its lively beauty to the beholder. A paper mill, now French owned, still exists. 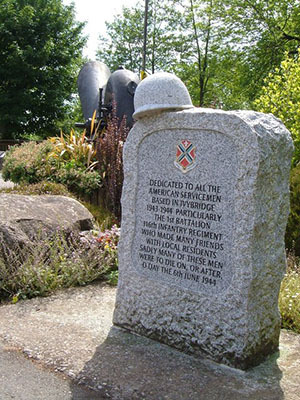 The 1st Battalion 116th Infantry Regiment was stationed in Ivybridge during 1943/44 ahead of D-Day when they were amongst the first troops ashore. Sadly many did not survive as the poignant memorial put up by local people testifies. The regiment were an infantry regiment of the Virginia Army National Guard who gave distinguished service during WWII from 1941. A woman light years ahead of her time, Dame Hannah Rogers, a member of the landowning Rogers family of the area, founded a school at Temarron Court in 1787 for Devon and Cornish pauper children. Now the Dame Hannah Rogers Trust provides profoundly disabled children from all over the UK with education and therapy as well as respite care – in Ivybridge. William Cotton, a resident of the town in the 1800’s, an antiquarian and author, gave his collection of the paintings of his friend, Joshua Reynolds, to the Plymouth museum. The middle of the 1850’s saw the advent of Brunel’s railway. 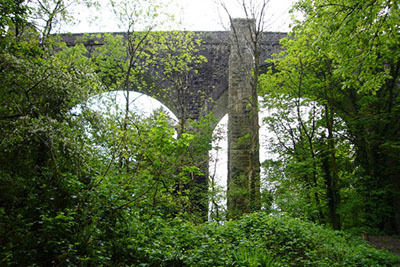 The remains of the original viaduct across the Erme still exists in Longtimber Woods, a place for strolls and picnics.The railway through Ivybridge closed in 1965 like so many others, but the station reopened in 1994 on a site east of the viaduct as part of the London to Penzance line. Acknowledgments and thanks must go to my muse Bob Mann and his book “Ivybridge” published in 1996 by Obelisk Publications. ISBN 1899073469. Bob Mann says he has never lived in Ivybridge but has family and childhood connections with the area. His love of Ivybridge shows through this work. While many would perhaps wax nostalgic about the past and decry the modern fast growing town, Bob Mann has shown clearly the spirit of his forbears who met the challenges of the times. Or you may wish to browse some more, please do, there are navigation buttons above on the left for your pleasure.